Carmen Lundy – Yoshi’s Oakland – June 16 & 17 – Shows at 8 and 10pm – Come see Carmen in a rare Bay Area performance. She is a wonderful musician and her voice is truly gift. Rachelle Ferrell is coming back to the Bay Area this fall at the intimate Rrazz Room – November 3-6. This room is intimate and cozy so tickets will definitely sell out fast. IMPULSE! Mondays John Coltrane featuring Marcus Shelby Trio featuring Mel Martin and Howard Wiley – Yoshi’s SF will host concerts on Mondays through the month of June celebrating the 50th anniversary of Impulse Records. Jazz and Democracy Project Fundraiser – Infusion Lounge – 124 Ellis Street – SF – 6-9:30 pm – The Jazz and Democracy Project, under the direction of Dr. Wesley Watkins IV, brings jazz education to students around the Bay Area. In a time where the support for music and arts are drying up in our schools, Jazz and Democracy is very vital and keeps jazz alive. Supper and Song Series – St Alban’s Parish Hall, 1501 Washington Ave, Albany – Wednesday – 6:45 pm – This month featuring Frank Jackson, Lisa Lindsley, Marscha, and Barry Warren performing Great American Songbook standards, originals and re-discovered gems. STILL BLACK, STILL PROUD – An African Tribute to James Brown – Featuring Pee Wee Ellis, Vusi Mahlasela, Cheikh Lo – Yoshi’s Oakland – June 9 & 10 – Shows at 8 and 10 pm. 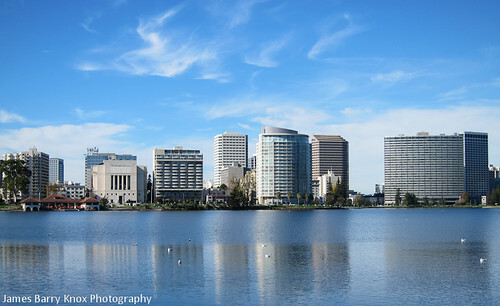 Photo of Oakland Skyline from Lake Merritt by James Knox. All rights reserved. This entry was posted on Saturday, June 4th, 2011 at 10:39 am. It is filed under 57th Street Art Gallery, Birdland Jazzista Social Club, Groovin' Around The Bay, Healdsburg Jazz Festival, Music News/Info, San Francisco Jazz Festival, The Jazzschool, The Rrazz Room, Yoshi's and tagged with Barry Warren, Black Music Month, Calvin Keys, Carmen Lundy, Cheikh Lo, Dave Grusin, Eric Swinderman, Frank Jackson, Healdsburg Jazz Festival, Hiromi, Howard Wiley, Impulse Records, Jazz & Democracy Project Fundraiser, Joey DeFrancesco, John Coltrane, Kenny Hawkins Latin Groove Project, Khalil Shaheed, Larry Smith, Lee Ritenour, Lisa Lindsley, Little Brown Brother, Marscha, Mel Martin, Pee Wee Ellis, Rachelle Ferrell, St. Alban's Parish Hall, Supper and Song Series, Vusi Mahlasela. You can follow any responses to this entry through the RSS 2.0 feed.